Captain Rommel “Daredevil” Sandoval. He is the commander of the 11th Scout Ranger Company in Marawi City and led his group to rescue his comrade and bravely sacrificed his life to prevent another casualty from his men. He was the first casualty from his company. September 10, 2017, the 11th Scout Ranger Company soldiers led by Captain Rommel “Daredevil” Sandoval were already on the second floor of the building they raided when they planned to save Corporal Jayson Mante. Five bullets and a grenade explosion from the Maute Terrorist Group left Corporal Mante wounded. He got stuck on the first floor of the building. Captain Sandoval decided to save him and was accompanied by Private First Class Sherwin Canapi. He asked his remaining men to cover for them. “I-cover fire niyo ako!” (Cover me!) Capt. Sandoval said before he started his mission together with Private Canapi. They successfully reached the location of Corporal Mante and confirmed that he’s still alive. However, several Maute terrorists located them and led to an inevitable battle. They tried to fight back, but unfortunately, a bullet hit Captain Sandoval’s cheek that resulted to his death. Meanwhile, Private Canapi also got fatally wounded and killed during the mission. Private First Class Sherwin Canapi. His companions describe him as a ‘talented person.’ He knew how to paint, write songs, talented in sports and good in writing reports. 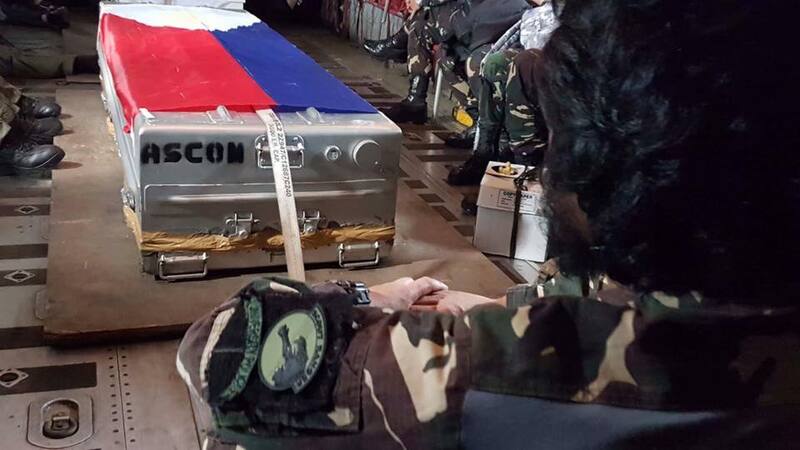 “Naabutan pa niya ang tao niya (Corporal Mante) at nakunan ng pulso. Kaso inabangan siya ng maraming ISIS at binaril una sa tagiliran. Kahit na dalawa lang sila, naka fire back pa [sila] sa mga bumabaril sa kanila. Kaso fatal ang sunod na tama ni Captain Sandoval sa pisngi,” Scout Ranger Books Facebook Page said in their Facebook post. Translation: He was able to find [Corporal Maute] alive with a pulse. Unfortunately, a lot of the ISIS saw and waited for them. They hit him at his side. Even though it was just the two of them [in the scene], they were able to fire back at the enemies. But the next hit at Captain Sandoval’s cheek was fatal. These two brave soldiers died in battle, but they have successfully saved the life of Corporal Mante, who’s now being treated in a hospital. Scout Ranger Books compared the story of Captain Sandoval to the famous war movie “Saving Private Ryan” where the lead character died rescuing his comrade. 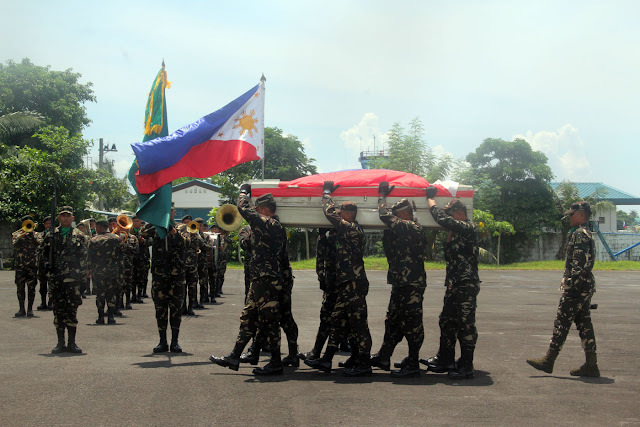 Last September 13, President Rodrigo Duterte visited the wake of soldiers Captain Sandoval and Private Canapi to honor them personally. Want to send groceries to your family in the Philippines? Possible! For a minimum purchase of Php3,500 at at BayanMall.com, delivery charge is FREE. If your recipient is outside the city area, P500 will be deducted to the total delivery charge. We deliver door-to-door anywhere sa Pinas in just 3-5 working days! If you have any questions about BayanMall Online Shopping, CLICK HERE. Last September 16, a pregnant woman went on to a forced labor after hearing the death of her boyfriend, Corporal Jaime Invento, during the battle at Bato Mosque in Marawi. Unfortunately, their baby died three hours after his death. According to the news information, she became so stressed after she knew of her husband’s death and resulted to the early birth of their baby. 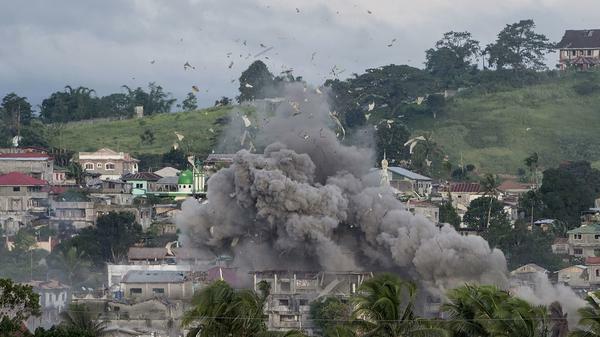 This Armed Forces of the Philippines successfully forced the Maute Group to abandon Bato Mosque in Marawi after a five hour long battle during that day. Among them was Corporal Jaime Invento, a scout ranger. A bullet fatally hit him in his neck which killed him immediately. The operation left four other soldiers wounded. Moreover, the government forces were able to rescue two hostages: Catholic Priest Terisoto “Chito” Suganob and Lordvin Ocopio, a teacher of Dansalan College in Marawi. Chito Suganob has been a hostage of the Maute Terrorists for almost four months. To date, Corporal Invento is the 45th scout ranger killed-in-action in Marawi City. Katulad ng typical Scout Ranger, si late Corporal Jaime Invento ay tahimik lang. Pero sa dedication niya sa trabaho, siya yung tipong ipapagkatiwala mo ang buhay mo sa kanya. 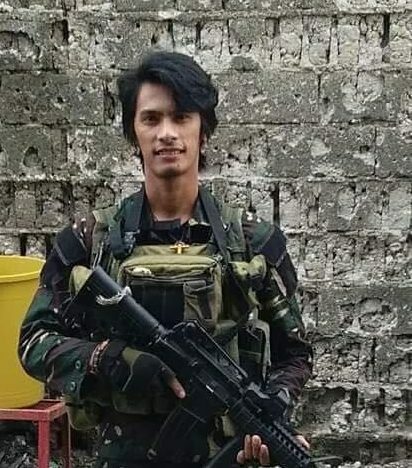 Napakabait din na kaibigan dahil bago nila simulan ang mission na kunin ang ISIS stronghold na Bato Mosque kahapon, minabuti pa niyang regaluhan ng combat boots ang kanyang buddy na may birthday kahapon. Pero sa pag assault nila sa mosque, natamaan siya sa leeg ng dalawang bala at namatay on the spot. Sa kasamaang palad, di kinaya ng misis niya ang masamang balita at nag forced labor. Namatay ang kanilang bagong silang na anak tatlong oras lang pagkatapos mamatay ang kanyang Daddy Ranger. Si late Jaime Invento ang pang 45 na killed-in-action namin na Scout Ranger. Mag request po kami ng dasal para sa kanyang kaluluwa at para sa anak niya. During the interview with the Inquirer at St. Peter’s chapel last Sunday, Anne (not her real name) excused herself. She then went to her boyfriend’s coffin and continued scribbling on a piece of paper — a farewell letter to Invento. “You have fought a good fight. It pains me more seeing you like this, but I’m letting you go now. Have a safe journey, Daddy. Always remember that you will always be my best ‘assaulter.’ You know how much I love you and I know how much you love me,” Anne said in her letter. At the back of the paper is another letter for Invento written on June 29. She addressed the soldier as her “dearest superman” and wrote that she missed him. “It’s been 36 days, eight hours, 15 minutes and 36 seconds since you went away. I know you are already tired and weary. Hold on, Mahal (my love), a little bit longer … and I love you so,” she said. A new law providing free education for over a million students in public tertiary and vocational schools nationwide has been signed by President Rodrigo Duterte last August 3. Senior Deputy Executive Secretary Menardo Guevarra made this announcement in an August 4 forum. It continues the administration’s initiative in the 2017 budget, where around P8 billion was allotted for free tuition for SUCs for school year 2017-2018. The Republic Act 10931 or “Universal Access to Quality Tertiary Education Act,” gives full tuition subsidy for students in State Universities and Colleges (SUCs), local universities and colleges, and state-run technical-vocational schools. The law also covers other charges, namely “library fees, computer fees, laboratory fees, school ID fees, athletic fees, admission fees, development fees, guidance fees, handbook fees, entrance fees, registration fees, medical and dental fees, cultural and other similar or related fees.” It also provides subsidies or stipend for poor students and establishes a student loan program. In addition, the Commission on Higher Education announced on June 16 it would be offering cash grants for medical students in public medical schools. However, students with financial capacity may choose not to avail of the subsidies through a mechanism created by the SUCs and local universities and colleges or LUCs. Budget Secretary Benjamin Diokno told lawmakers on August 2 that subsidizing tuition in public tertiary schools would be too costly. Guevara said that free tuition will have an estimate of around ₱100 billion. According to him, the government cannot afford that. Diokno also added that only middle-class and upper-class students would benefit from the scheme because, statistically, only 12 percent of the poor get to the state universities. So, [in a sense] it will actually subsidize the rich. However, opposition lawmakers said in an August 3 statement the free tuition law would cost only around ₱15 billion. Want to send groceries to your family in the Philippines? Possible! Visit our website at BayanMall.com. We deliver door-to-door anywhere sa Pinas in just 3-5 working days! If you have any questions about BayanMall Online Shopping, CLICK HERE. When Rodrigo Duterte assumed office as president, the Parojinogs demolished their mansion in Ozamiz City and lived instead in a smaller house. The Parojinogs have been political kingpins in Ozamis City. As to why they demolished the house remained a mystery to the residents there. Some said that Parojinogs did it to avoid more suspicions in their involvement in illegal activities. Last week, City Chief of Police Senior Inspector Jovie Espenido visited the old mansion of the Parojinogs in Bacakay, Ozamiz City. “As if hindi sila mayaman, bumalik na sa kanilang bahay na maliit para siguro… eh alam naman ng lahat na involved sila sa drugs,” Espenido told TV 5. Espenido suspected that the family was hiding something from the current administration. According to the information received by the authorities, the old mansion of the Parojinogs became a ‘cemetery’ for their political foes and illegal drug trade competitors. They believe that it is also a meeting place of the alleged members of their syndicate to plan for their next crime. Brgy. Captain Ludvina Macayran has received complaints from the residents in the area about a foul odor sometime in February that made the council filled the place with trucks of soil. Because of that, Espenido ordered the Ozamiz PNP to dig the demolished mansion for proof. They found no human bodies. Rather, they only obtained sacks of garbage. Two sacks tied with rope only contained bones and feathers of animals. Meanwhile, 16 people were killed during the anti-drug raid in Ozamiz City, including Mayor Aldong Parojinog and Board Member Octavio Parojinog. The police arrested Vice Mayor Nova Princess Parojinog and other members of the Parojinog clan. The vice mayor was discovered to have a relationship with Herbert “Ampang” Colangco, one of the suspected Bilibid drug lords. After the operations, a man identified as ‘Noel’ claimed that he had worked as hitman and drug courier for 20 years for them. He admitted that he was ordered to pick up shabu from National Bilibib Prison several times and deliver it to Ozamiz City. According to Noel, the Parojinogs divided the illegal drugs he delivered and started to sell it to other pushers in Ozamiz. They were also involved in holdup operations, and murdering their political foes and business competitors. He also mentioned that he chopped bodies of the people who were ordered to be killed before burying them. Information point out the mansion as the said place. As a result of the absence of leadership, Irene Engracia Luansing became the acting mayor of Ozamiz and Michael Llamas Tagal as acting vice mayor. The locals in Ozamiz City publicly expressed their views against the Parojinog family. They wore white shirts and attended the rally. They believe that this will give birth to a new Ozamiz City. A community prayer in front of Ozamiz City Hall on Sunday was led by Pastor Nathaniel Dinoro. How do you know that He/She is “The One”? Remember the Jollibee ads that brought us all into tears? Well, “The Vow” segment takes us to a back story of meeting your perfect pair at the perfect time. Indeed, one of the most complicated, but most fulfilling experience in the world is to love and be loved in return. But inasmuch as we want to know sooner if he/she is the one, it most often does take time to know and feel. So, we wonder, how do we know? Well, we should have realistic expectations and realize that we marry potential and not perfection. Jeremy Goff shares five signs that they are the right one for you! 1) They put in effort. If marriage is meant to be a two-way partnership, then dating needs to be a two-way road as well. If you find yourself in a relationship where you are putting in all, or almost all of the effort it is a red flag that the other person is either not right, or not ready. One of the best pieces of dating advice I have ever been given was by my sister Paige. I was chasing a girl that I liked and Paige asked me, “Does this girl put in any effort?” She then continued “When you find the right girl, she will put in as much effort to making it work as you do. If she is not putting in the effort she is not the one.” I did not want to hear that because this girl was not putting in any effort. Eventually, the relationship fizzled out and I realized Paige was right. For a relationship to last, both people must be fully invested. When you find the right one they will recognize what you are worth the effort. You will both sacrifice and both be willing to pay any price to be together. When you find the person that you are willing to do that for and who is willing to do it for you, then you’ve found the one. 2) They put God first, but put you second. This one is huge. Most people think that they need to put their spouse first, but God really needs to be number one. This will ground them to their core principles of honesty, faith, sacrifice, forgiveness, and most of all their commitment to keeping their promises. You not only need to find someone who puts God first but also someone who will not begrudge you for putting God ahead of them. In all things, our covenants to God must come first. Ask yourself, if I was to die, would they raise my family in the faith? A big secret in successful marriages is something called the marriage triangle, God is at the top and husband and wife are at the bottom corners. As a husband and wife draw closer to God they actually draw closer to their spouse. Happy couples put God first. After God, your spouse should be a solid #2. No one and nothing else, other than God, should come before your spouse. Too many Millennials are selfish, they put themselves before others, and even before God. This attitude will destroy any relationship. Lasting marriages have men and women who have put God first, but their spouse in front of themselves. They forgive each other, they serve, love, and desire to make their spouse feel happy and loved. So when you find the one who puts God first and you second, you’ve found the right one. 3) They love you right now. Your future spouse should inspire you to be more than you are. But they should be completely in love with you, not a future you that has lost those 15 lbs, not you without your nerdism, but you that you are currently. One of the biggest mistakes single people make is thinking that they need change the elusive ‘something’ to find the right one. I can’t tell you how many guys go to the gym to get a body to find a girl. Seriously, people, if they would not give you the time of day because you can stand to lose 15 lbs, then they are not the right one! It reminds me of the scene in How to Train your Dragon where Hiccup is talking with his dad who says he needs to change and then just points at Hiccup. Who then replies, “You just gestured to all of me.” to which his dad replies, “deal?” Later in the movie, his dad says, “Turns out all we needed was a little more of…” as he points at hiccup. Your future spouse will love you, all of you! No stipulations. Yes, they should inspire you to be better a better person, but they will never require it. They will accept and love you with all of your nerdisms and your quirks. They will love you for who you are, right now. Their love is not based on how you look, but who you are. They will love you as you grow and change over time. When you have found someone who loves you like that, you’ve found the one. 4) They Make Time For You. On the flip side, you have the person who makes time for you. Sure they are busy, they have obligations they need to fulfill, work, school, church, etc. But they find a way to make time for the people they care about. The truth is there are a lot of activities we do that if you wanted to make time for another person you could do it with them. You could cook dinner together, study together, go shopping together. If they make time for you, you’ve found the right one. 5) They Make Time For You. You’ve found the right one when you are willing to give up everything for them, but they would never let you do it. They see your dreams and realize that it is the essence of who you are. They are willing to sacrifice to help you reach your aspirations, and therefore enabling you to live your dream. Do you agree with these five signs? Have you found “The One”? What can you say on the new Jollibee Ad? Just comment below! You must have heard and danced to the tune of Despacitos a lot of times already, and you must have watched several parodies and covers of it. Well, we’re bringing you a Despacitos parody like no other. Featuring Mikey Bustos, here’s I Wear Speedos. How was it? Comment below! As per writing, the I Wear Speedos video has almost 2 million views on Youtube and 30 million on Facebook via The Erin M. Show. Purchase P5,000 worth of groceries or above at BayanMall.com. Promo applies ONLY to grocery items and packages. Promo runs from October 17-31, 2016. Payment must be not later than October 31, 2016. *Deliveries within the city are free. For deliveries outside the city, customer will get P500 off their total delivery charge. Nowadays, a lot of online grocery shopping stores are established and a lot more are coming in the market, especially, online supermarkets. For first timers, or even those who are into online shopping already, you may be reluctant to purchase online because of a bad experience or the cost in exchange for convenience and quality. To give you the brighter view, here are some of the benefits you get when you buy your groceries online. You don’t have to wait anymore for the next working day just to place your order or if you have inquiries. Normally, online shopping stores have 24/7 customer service assistance to accommodate all customers who wish to purchase or ask about their products and services. The traffic inside supermarkets, especially in peak hours, is heavy. So, spare yourself of the trouble of standing and waiting! Try shopping for your groceries with just the use of your computer or smartphone wherever you are. Most people in these modern times are time conscious. As much as possible, we want convenience and efficiency. Purchasing goods online wouldn’t demand so much of your time. Unlike the actual store, you won’t be taking up time roaming around trying to find the products you want. In online grocery shopping, you can find the items you want in just a few clicks! They are also grouped in categories for better and faster finding! Use your time by spending quality moments with your family and let these online stores do the shopping. Finding it hard to look for a space to park your car? No problem! Especially on holidays like Christmas, where all parking spaces are all filled in, you won’t even need your car when you shop online! You can choose to have your orders ready for pick-up or have them delivered at your doorstep. Simple. Online shopping companies are obliged to provide the freshest produce and quality products available in the market. Products in poor quality are subject to returns, refunds, or replacement. You’ll never have think of leaving your house anymore just to buy groceries. All you have to do is sit back, relax and wait for your orders to arrive. Most online supermarkets would ask you to purchase your products 3-5 days ahead of desired delivery date to ensure availability and quality. Most grocers would always have a list of items to purchase that fits their budget. When we go to the store, we often come across items that are so tempting to buy, cutting the budget we try to save. Oh, and don’t forget the food carts and stalls after you pay for your groceries in the checkout counter! Online shopping companies have various promos and discounts. These are visible on their site or given through e-mail when you subscribe to their newsletters. Most of these promos appear during holidays and other celebrations. Here at BayanMall, we can offer you a wide selection of grocery items. So, what are you waiting for? SHOP NOW! Visit our website at BayanMall.com. We deliver door-to-door anywhere in the Philippines — Luzon, Visayas and Mindanao!